Chelsea is the surprise winner over Jupp Heynckes’ Bayern Munich in the 2012 UEFA Champions League. Chelsea’s manager, Roberto Di Matteo was put in charge of Chelsea after Andres Villa-Boas was relieved of his duties by Roman Abramovich due to a poor run of matches and unrest in the dressing room. Di Matteo sent Chelsea out with a game-plan to contain Bayern and, for the most part, the policy worked as Jupp Heynckes’ side sought to pick holes in a resolute defense. Chelsea lined up in a 1-4-2-3-1 Petr Cech in goal; Ashley Cole at left-back, David Luiz and Gary Cahill, Jose Bosingwa; pivots Frank Lampard and Jon Obi-Mikel; Ryan Bertrand, Juan Mata in the 10 roles, Salomon Kalou; and Didier Drogba as the lone striker. Jupp Heynekes’ Bavarian side lined up in his signature –1-4-2-3-1 sweeper keeper Manual Neuer, Phillip Lahm (captain), Jerome Boateng, Anatoliy Tymoschuk, Diego Contento, pivots Bastien Schweinsteiger and Toni Kroos, attacking trio of Arjen Robben, Thomas Muller, and Franck Ribery; Mario Gomez the lone striker. The London club took a conservative approach to the match, meaning they understood that Bayern is dangerous on the counter, so they applied minimal pressure on the ball. This approach saw Bayern with lots of possession throughout the match. Schweinsteiger and Kroos combined for 223 touches compared to Lampard and Obi-Mikel (183). Further Bayern’s 44 shots (7 on target) compared to Chelsea’s 10 (3 on target), respectively show the Bayern’s attack was relentless. 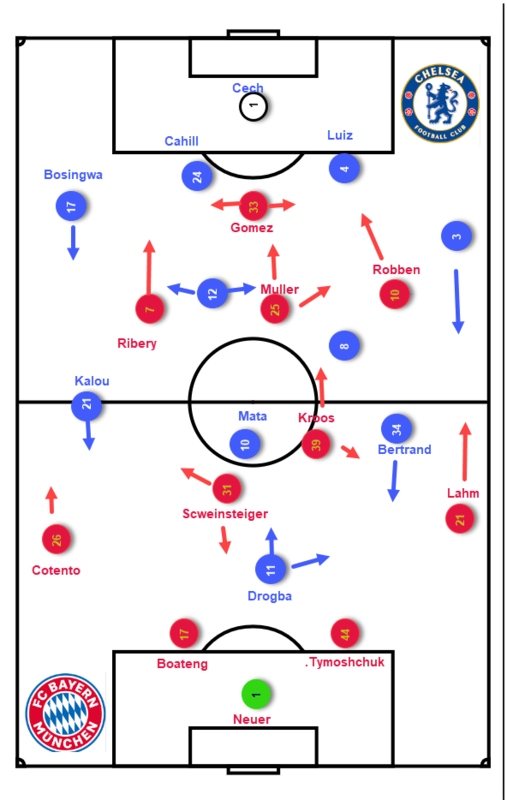 This went according to Chelsea’s conservative approach was effective because they were able to maintain their compact shape and stay relatively close to Robben, Ribery, and Schweinsteiger. Ribery and Robben were given license to attack the left and right wide spaces. Midway through the first half, Robben wriggled into space inside the box, but the former Chelsea winger was denied by a smart reaction stop from Cech, who diverted the ball onto the post. Fullbacks Lahm and Contento provided defensive cover while Kroos and Schweinsteiger protected the central and half spaces. Schweinsteiger, in particular, was a critical component of Bayern’s distribution and halting opponents counter-attacks. As Chelsea’s lone striker Drogba was expected to do more than just score goals, creating chances for his teammates. In addition to those duties, he pressured Boateng and Lahm. Nothing really went right for Chelsea in an attacking sense, though – they struggled to generate counters, Drogba found himself overloaded when he pressed Philipp Lahm to try and use his aerial advantage, the delivery from the right was poor. Chelsea also failed to win a corner until the final moments, so set-pieces wasn’t a productive source of chances, while long balls from Petr Cech generally found Tymoshchuk nipping in front of Drogba and Jerome Boateng covering behind him. Muller increasingly became pivotal for Bayern because he was popping up at the far post, against Cole. Muller had five attempts from a similar position, and also got John Obi Mikel booked for a rash tackle towards Chelsea’s left-back zone. Muller was the key player in tactical terms and would have been a fitting man of the match. Heynckes had responded to Chelsea’s change by introducing an extra defender – Daniel van Buyten came on to provide a more aerial presence at the back, with Muller departing. Like Chelsea’s change, it was simply another man to help in the required zone for five minutes. Even though Bayern lost the match they were tactically superior. The game and tactical intelligence of Schweinsteiger and Kroos meant they could continue to control the match and create chances. While the Raumdeuter, (Muller) movement created all sorts of problems for Chelsea for which they had no answer. Earlier this monthThierry Henry was appointed AS Monaco chief after Leonardo Jardim was sacked. Henry is somewhat of a prodigal son; he returns to the club where it all started. Heading into the match, I figured Thierry would be in his assessment phase, and probably not wedded to a starting eleven or shape. Keeping that in mind, I was very curious to see how he’d approach (i.e., game model) this pivotal moment in his life. I felt we wouldn’t see a drastic change this early in his tenure. Still, for this match his used 1-4-3-2-1/1-4-4-2 which is not too surprising. I anticipate him switching up his second season, provided he is retained. I guess time will tell, but in the meantime, I am conducting an exploratory assessment of Thierry Henry’s first three matches in charge; RC Strasbourg. Again, this is exploratory so I will use some mostly qualitative in the form of match clips, field notes, and observations. This piece is will cover the RC Strasbourg match which had the makings of exciting Ligue 1 match. Can you imagine kick-starting your career in the relegation zone and on the road? If you’re like me, your answer was probably an emphatic no, but Thierry took it all in stride despite not winning; notable performances from Nacer Chadli, Youri Tielemans, fullbacks Sidibe and Henrichs. The host lined up in a -1-5-4-1 because of the natural overload that occurs with three centre-backs. Strasbourgs wingbacks, Carole and Lala, served two functions width and freedom to attack. RC Strasbourg’s wingbacks’ extended position was used to stretched Monaco central midfielders. Early in the first half, Strasbourg’s attacked the left flank; Carole (LWB) and Thomasson (LW) and Costa which overloaded Monaco right fullback, Jibril Sidibe. Consequently, this weakened Monaco’s presence in central and left half and left wide spaces. Monaco put pressure Strasbourg’s wing-oriented attack with their customary 1-4-4-2 which resulted in Golovin and Aholou adopting positions close to Thomasson and Carole. Jovetic and Falcao kept high places in their shape. However, they did not press the center back due to numerical superiority of three center-backs. Monaco’s ball orientation gave them a decent amount of defensive success in their press in wide areas, it played a significant part in their ultimate downfall. With both central midfielders and six occupied by Strasbourg’s central and wide midfielders, Henry’s side was manipulated by their opponent. Aholou and Chadli got dragged into wide positions, through movements of Goncalves and Thomasson. Consequently, the effect was a lack of presence in central areas from the away side which exposed the away side to counter attacks. Monaco’s high press in the opponent’s half was avoided due to the home side playing itself out of danger and launched a counter. Monaco had numerical superiority, yet Goncalves was able to send a cross into the box and Thomasson’s header into the back of the net. Against the counter, Monaco struggled They were unable to prevent ball movement from the first line and were somewhat caught on the back foot. As a result of their poor counter pressing, Monaco struggled to organize on the break. Following the first goal, the visitors shifted their attack centrally through Belgian playmaker Youri Tieleman. He was joined by Nacer Chadli and Aholou. Chadli as a number 8 was interesting; at first, it seemed odd was probably was something the gaffer considered when he was an assistant with Belgium. At times Chadli looked perplexed in central midfield, but his strong physique added strength in a disorganized midfield. Things did not get easier for the visitors; center forward Jovetic was substituted for Samuel Gransir who after 1 minute was sent off with a straight red, for a high boot. Now Monaco was down to ten men Strasbourg looked to exploit their advantage. As time progressed, Tielemans showed his brilliance in central and half space; his magnificent through balls were squandered due to poor positioning and lack of team cohesion. This should be expected for a team poached of its star players that helped win the Ligue 1 two seasons ago. Communication–-there was virtually no communication (verbal or nonverbal) between player. Poor ball retention—far too many balls were lost to careless passes made. Susceptible to counter attacks–-this is an area that needs immediate attention if they hope to turn things around. Investment in a destroyer would help shut down counters. Welcome to my latest post analysis, this week we take a look at Championship sides Nottingham Forest and Millwall FC. I was expecting a real treat and both sides didn’t let me down. Aitor Karanka Forest failed to secure a win in front of the home crowd against midtable side Millwall FC. Making just 7 shots in the 90 minutes, they were evidently the better team against Neil Harris’ Millwall who has bounced back from a 2 goal deficit earn a solitary point on the road. On the other hand, Aitor Karanka worked under José Mourinho, which shows quite clearly in how he set up his team. Forest. Aitor Karanka set up in his standard 4-2-3-1. Pontilimon was the goalkeeper protected by a back four of Jack Robinson, Danny Fox, Michael Hefele and Saidy Janko from left to right. The double 6 partnership of Jack Colback and Adlène Guedioura were flanked by Ben Osborn on the left, while Joe Lolley featured on the right. Forest utilized a central organization in the attack, with João Carvalho playing just deeper of Lewis Grabban. Millwall. Neil Harris’ men lined up in a formation, 4-4-2, which has seen little change this season. Ben Amos started as goalkeeper behind their standard back four of James Meredith (LB) and Mahlon Romeo (RB) on either side of the center back partnership with Jake Cooper and Murray Wallace. The two central midfielders were Ryan Leonard and Shaun Williams, supported strikers, Lee Gregory, and Tom Elliot. Shane Ferguson saw the majority of the ball on the left wing, while Jiří Skalák on the opposite. In Forest’s possession, there was a developing partnership between Colback and Guedioura which was pressed against easily. The center lacked support by wide players, with both very wide in anticipation of playing through the touchlines, and when Lolley came inside as the first half progressed, he contributed very little and was caught out on a few occasions. Early on, João Carvalho occasionally offered support he held positions in the 10 space somewhat like an Enganche. When Lolley cut inside because this benefitted Forest’s possession game, he utilized his pressing resistance and combinations with Carvahlo and Osborn to counteract Millwall’s high-pressure system. Furthermore, Carvahlo and Osborn’s support, Millwall’s midfield partnership (Leonard and Williams) sat deeper in their ball-orientations on Forest because there was a threat of the 10 space being exploited behind. Aitor Karanka seemingly noticed this, and you could immediately see Lolley rotate with Carvahlo, who more frequently dropped to support Colback and Guedioura, while Osborn drifted inside too. Besides, the positioning of the two central midfielders improved midway through the first half–this allowed Lolley to drift inside to make a magnificent strike to land on the score sheet. These small changes Forest’s made led to more control as the game progressed. In the second half if the opposition switched to ball-orientation, therefore they pressed more aggressively in an attempt to restrict access to Lolley, Carvahlo, and Grabban who had a quiet first half. Increasingly in the second half, Robinson put more crosses in the box to connect with Grabban. Even though Forest had more possession (58%), Millwall began to assert control of the game. However, it came at cost from Ryan Leonard’s foul on Carvahlo which resulted in a free-kick. awarded in dangerous territory which led to a goal. The visitors from London had good support from wide areas in the form of both wingers whilst Leonard and Williams supported as well. Defensively, they were stronger–Shaun Williams, in particular, had a great game 10 interceptions and a goal in the 70th minute. In possession, Millwall has a significant focus on their left flank and this match was no different with just under half of the attacks channeled down this third. Ferguson and Meredith have a great partnership, they threaten excellently in these situations. Their attack down the left side is down to the movement of the two wide players, but in particular with Ferguson. Consistently, he used speed to get behind Forest’s Swiss right full-back, Janko, to send a whipping cross to Gregory and Elliott. Surprisingly Karanka didn’t play it cautious and instruct Janko to sit deep. Forest’s manager is not known for his tactical flexibility. Millwall turned the table on the host. The first sign momentum was shifting in favor of the visitors was Forest low-intensity and complacent press. Further, Pontilimon’s poor throw to left-back, Robinson, Millwall’s Robinson intercepted it, then crossed it to Shaun Williams who headed it home to make it 2-1. Late in the match, Forest was disorganized and confused in and out of possession. Karanka saw his side were in trouble so he made last a last-ditch effort to shut the door by bringing on Michael Dawson for Joao Carvalho. However, it proved a little too late because Harris brought on attackers, Steve Morison, and Tom Bradshaw. Forest’s compounded disorganization and poor concentration led to Lee Gregory’s equalizer. Harris’ Millwall fully deserved their point after a strong comeback over promotion contenders, Notting Forest. Karanka’s men started strong but later in the match, they had no answers for the visitors. Karanka needs to get his back four sorted as soon as possible because they’ve conceded 13 goals. From a neutral’s standpoint, it was a great game to watch. Currently, Forest is 5th in the Championship table if Karanka’s men sort the defensive issues they could contend for promotion to the top flight. This piece is an introduction and announcement of the launch of my blog “6th Disciple Analytics” the place football enthusiast of all levels can access digestible football match analysis. This blog will be a resource to folks that love football but for one reason or another don’t enter spaces where they can ask questions without being ridiculed or ignored. So this is where I come in, and hopefully a few other enthusiastic lovers of the beautiful game, to provide player, manager, club, and match analyses. The idea is to provide platform for football diversity–domestic leagues across the globe. Though I love UEFA as a confederation it is not the lone wolf on this planet so the aim is to write about leagues in Europe and as far as New Zealand. Don’t get me wrong I plan on writing about the North London Derby, El Classico, and the Eternal Derby too, this will be a place for up and coming writers and analyst to showcase their skills and meet people where they are. Please if you have ideas about what you would like to see from the site shoot me a DM. Thanks and I look forward to hearing from you soon.